A third, a lecturer at a higher-level institution, told me of a student walking into the classroom with twenty minutes to go in the tenth of a twelve-lesson series. This was his first time to come to class. He wanted to write the four essay assignments he’d missed because he needed to pass the class. In twenty minutes? No. He expected my friend to stay that afternoon and supervise. To work, for free, to accommodate his schedule. When the friend said no, the student accused him of being inflexible. He was a sportsman. These lessons were interfering with his play. They needed to be more accommodating. That my friend had already extended the deadlines for each assignment to accommodate the litany of excuses from a body of students who didn’t seem to understand the concept of deadlines was neither here nor there. After a tirade of abuse, the student left, promising to take it further. Another lecturer-friend told me how their bonus (an extra payment on top of their pittance of a salary) was tied to the students’ appraisal of their teaching. I was gobsmacked. So, if you are lax in your teaching, flexible with your deadlines, kind in your marking, you will make more money but your students will be ill-prepared for the world that awaits them. But if you are rigorous in your teaching, steadfast in your deadlines and critical in your marking, you lose out. The students will gain but you will lose. Why are teachers in Hungary undervalued so? They are responsible for producing the minds that will govern tomorrow. Education is a crucial part of shaping our future. Why is it being undermined? The new laws affecting CEU are high-profile but the problems appear to run right through the education system. But the most disturbing conversation I’ve had in recent weeks struck me as encapsulating the palpable frustration of a society that seems to be imploding. 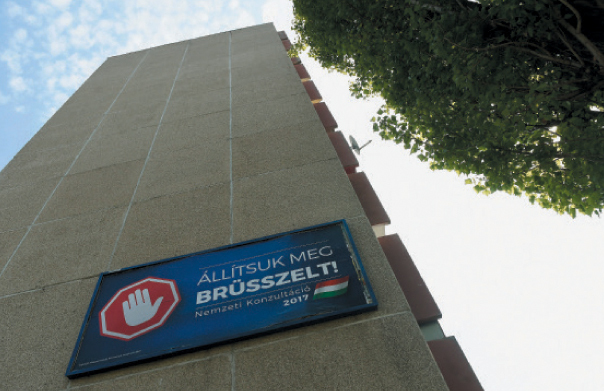 There’s a building in Buda where one tenant has been intimidating his neighbours for years. House meetings are no longer attended because of the abuse he hurls at the other tenants. He has sabotaged plans to improve the building so it’s decaying. It’s a small house. Many of the tenants are retired couples who have lived there since it was first built. They’re good people, another friend told me. They want little more than a safe environment in which to live. One free of harassment. A community that works together for a common cause. They tried hiring external companies to manage the upkeep of the building and the common cost each of them pays towards its maintenance. In the past seven years, five such firms have quit because of this one man and his bullying behaviour. Now, the word is out. The monthly common cost has spiralled upwards because each new company wants an exorbitant fee to manage this one tenant. Time is being wasted. Reputations are being ruined. General funds are being depleted. And his attacks are not limited to his fellow tenants. When individually they hire someone to work on their flats or to fix, say, lights in the hallways, he harasses these workers, too. Like the management companies, they also require what amounts to “danger money” to work there. He has physically assaulted one tenant, verbally abused the others. The police were once called to forcibly remove him from the management company’s office. His verbal rants have been documented on video, to little avail. The nightmare continues. The courts have let them down. The property management companies are reluctant to get involved and charge exorbitant prices to do so. The legal system isn’t helping. And a group of people who simply want to live peaceably with their neighbours is caught between the proverbial rock and a hard place. As long as he’s in residence, their flats won’t sell. So, they can’t move. With little option but to stay and persevere, they’re forced to live in the shadow of a blustering bully who picks on the vulnerable, stands in the way of development and is seemingly determined to ruin his own little fiefdom. Mary, you ned to mix with a wider circle of people! Lecturers are born with countless grievences in their heads.